When a parent picks up a book like this to read, it’s probably more out of desperation than casual interest. It’s easy enough to find material describing PAS and how devastating it can be. It’s something else to find anything which proposes countermeasures. That’s what Amy Baker’s book tries to do. In interviews we hear from 40 adults who by their own accounts were victims of PAS, and have broken free of it. The book’s introduction poses intriguing questions, such as: “What did the targeted parents do to help their children realize that they had been manipulated? 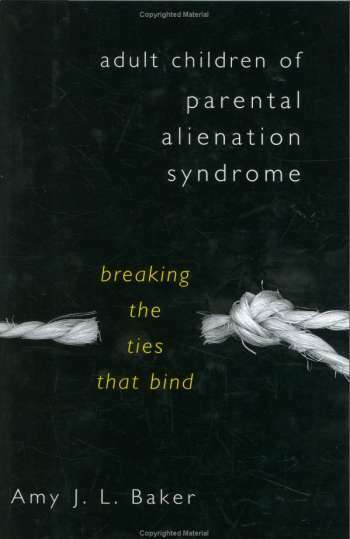 What more could they have done to prevent or mitigate the alienation?” These are questions that many an alienated parent has asked, and this book promises answers. The adult children felt hurt and angry when the targeted parent finally gave up trying to have a relationship. No matter how adamant they had been that they wanted nothing to do with the targeted parent, they were still shocked when the parent respected that choice and walked away. It was usually experienced as rejection. This gem of hard-earned knowledge alone may be worth all the effort it took to dig out. Don’t give up, ever, is the message. As a parent who has been there, and at least sometimes did give up, your reviewer has gained from this book the resolve to try again, no matter how painful it is.